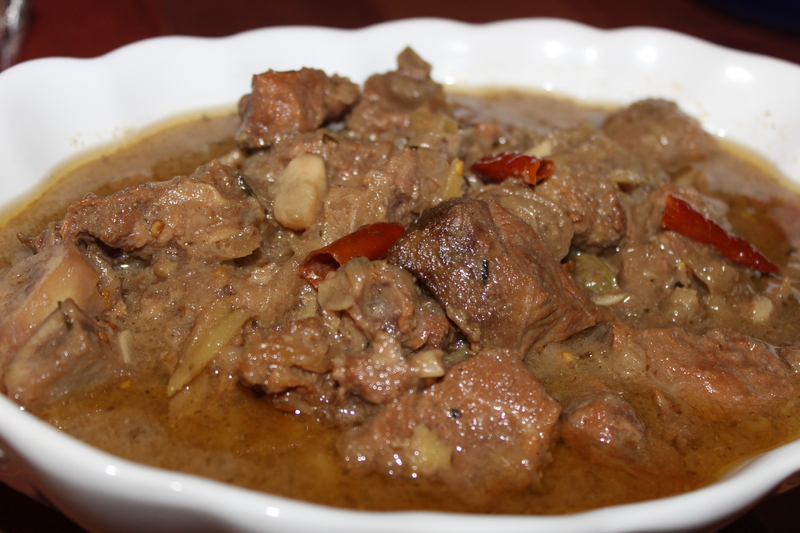 This preparation is a combination of “Kata moshlar mangsho” and my “white beef curry” . So different in flavor yet so delicious . This a slow cooked process . The meat need to be cooked on low heat . 1. Marinate the meat with all the ingredients mention above , except dried red chilies . 2. Now take a maslin or cheese or cotton cloth and put all the whole spices mentioned for masala packet . Tie up the cloth into a packet . 3. Heat oil and add the meat . add little water . Add the masala packet into the meat and close the lid . Cook on low flame . The meat will release water and will cook in it’s own water . So you need to keep the flame on low and the lid must be on . 4 . Check every 30 minutes . If you need , if the water is dried out add hot water little by little and cook . When the meat is almost done add the dried red chilies and cook another 15-20 minutes on low flame . 5. Just when you turn off the stove , take out the masala packet from the meat and keep the meat pot on the turned off stove with lid on . If you wish , you can add 1 tea spoon kasori methi at the end . But I found the whole methi brings out the real flavor .